The map illustrates the additional “areas of unusual hazard” for transportation to and from the public and private schools of the district in conjunction to the initial map created and adopted on October 9, 1991. The Board acknowledges the support of the Marathon County Sheriff’s Department in development of this enhanced plan for the safety of students in the district in a letter dated June 20, 2016. In essence, the “areas of unusual hazards” is expanded to include any village street without sidewalks as recommended by the Marathon County Sheriff’s Department. On village streets without sidewalks, there will be appropriate “bus stops” created so that safety is enhanced and minimizes the distance for walking in a safe manner. Those students who qualify for this school bus transportation will be picked up and dropped off without regard to standard bus route attendance procedures. When approved, this revised policy would be in effect July 1, 2018, and be submitted to the Wisconsin Department of Public Instruction under §121.54 in order to receive the appropriate transportation aid for additional ridership under this policy. Approval was granted on June 26, 2018. 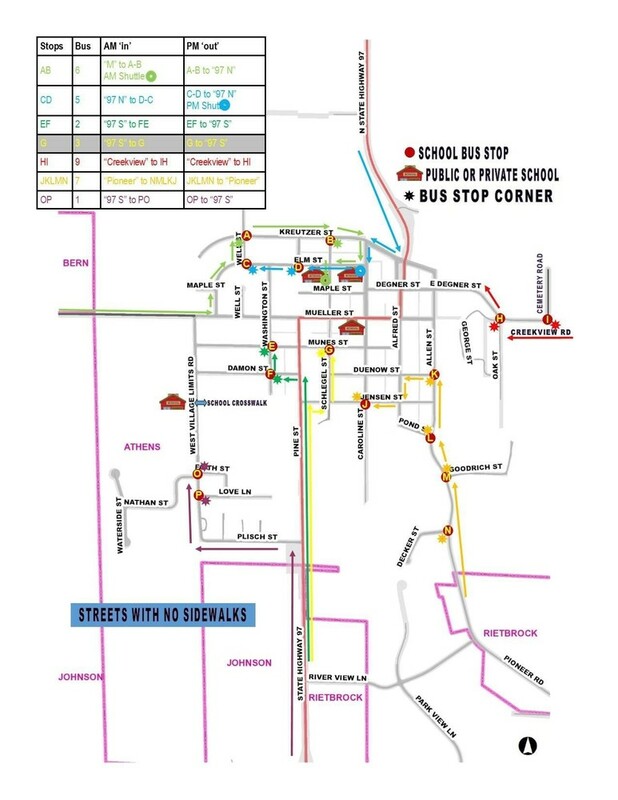 Below is the locations of the new School Bus Stops in the Village of Athens.